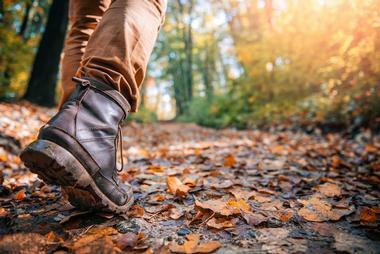 Boulder residents and visitors will never get bored when choosing a hiking destination – there are 145 miles of trails and endless options on offer, whether you have just an hour or a whole weekend. 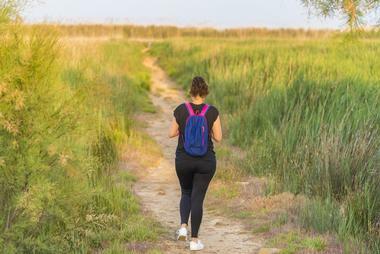 Located at the foothills of the Rocky Mountains and surrounded by lush prairies full of grasses and wildflowers, choosing a destination often depends on your fitness level and whether you are bringing a dog. 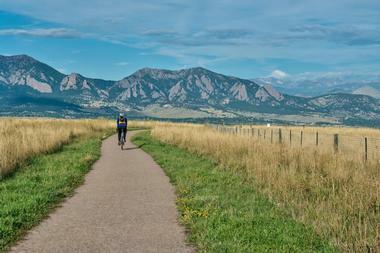 Most trails going west start in the vast Chautauqua Park. Flagstaff Mountain is located at the city's outskirts and offers short but strenuous hikes. Mount Sanitas is another popular destination, also fairly difficult but with views at the top that are worth a bit of scramble. 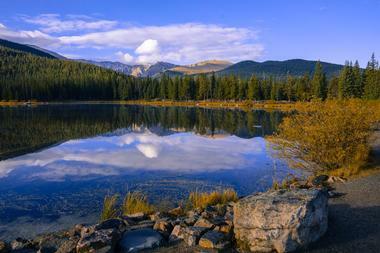 Arapaho Glacier is located in Roosevelt National Forest, bordering Colorado's North Arapaho Peak. This alpine glacier was once the largest glacier in Colorado but has lost more than half of its surface area over the last century. The trail is very popular and busy. From the Arapaho Glacier trailhead the trail leads to Arapaho Glacier Overlook after 6 miles and to the Fourth of July Mine after 7.8 miles. Two trails intersect the Indian Peaks Wilderness, first through dense forests and then through the open tundra, from where the view of the entire city of Boulder watershed is spectacular. The highest point is South Arapaho, an overlook of the Arapaho Glacier, at 13,397 feet. There is a seasonal campground at Rainbow Lakes, but campfires are not allowed. Dogs are allowed but must be on a leash. 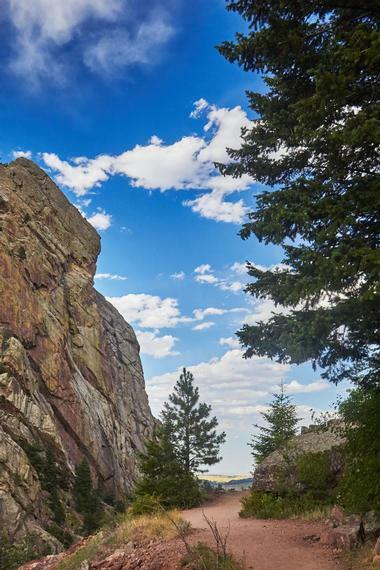 Following the old road from Chautauqua to the Bluebird Shelter for about half a mile, visitors will find the trailhead for the Royal Arch trail, which leads to one of the most popular hiking destinations in the Boulder area. 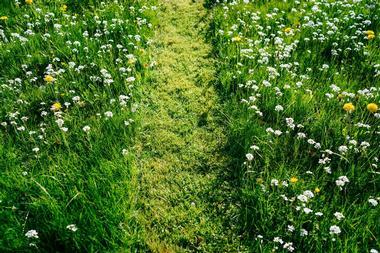 The hike is only about a mile and half long and starts out across a lovely meadow full of wildflowers. Once you enter a pine forest, the trail is steep and fairly strenuous, leading upwards all the way. The rock arch at the top and the fantastic views of Boulder and the Flatirons are well worth it. From the Hessie trailhead near the town of Netherland, Colorado, the Lost Lake Trail is a busy 4.1-mile loop trail that leads to a small yet charming lake. It is a lovely hike that passes through meadows full of flowers, past small, cool waterfalls, across streams, and through pine forests. This moderately difficult trail is accessible all year round and is used for hiking, horseback riding, birding, and snowshoeing. 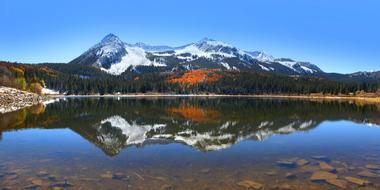 The elevation at the trailhead is 9,000 feet and at the lake it is 9,800 feet. There are a number of campsites around the lake and campfires are allowed; so are dogs as long as they are on the leash. 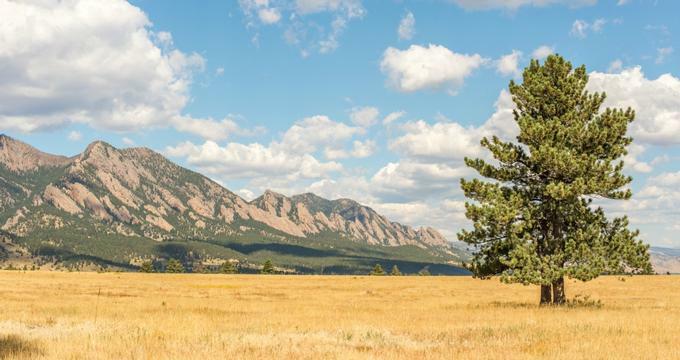 The Mesa Trail is 13.4 mile-trail that runs through Boulder's foothills, blooming meadows, and dense, old pine forests, with fantastic views of the Flatirons, connecting Chautauqua Park with Eldorado Canyon Road. This popular trail is fairly easy, the change in elevation is only 437 feet, and horseback riding and dogs on the leash are allowed. Many side trails lead to other destinations: Green Mountain, South Boulder Peak, Bear Peak, Royal Arch, Mallory Cave, Fern Canyon, and Shadow Canyon. You can start at the Chautauqua trailhead or take the more strenuous, but also more scenic, Bluebell Trail towards the Flatirons and join the Mesa Trail after about a mile. At the end of the Table Mesa Road in Boulder starts a trail that will take you to the National Center for Atmospheric Research, or NCAR. From the NCAR trailhead at the center is a short distance to the Mesa Trail and many other trails that branch out in all directions from this major trail. If you go south on the Mesa Trail, take the Bear Canyon trail, which will take you through a narrow canyon with high, almost vertical, walls with a few waterfalls deep below. Once at the top of Bear Canyon, you can choose the Green or Bear Mountain trails, which lead to the summits of these two mountains. 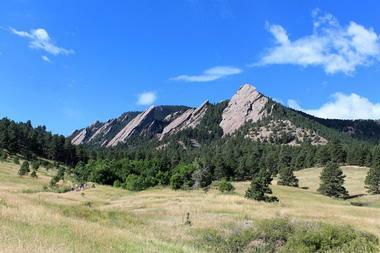 Another nice trail leads from the NCAR trailhead to the Mallory Cave, with fantastic views. Just like a popular Mount Sanitas Trail, the Anemone Trail starts at the Centennial Trail, beginning as the Red Rock Trail and then branching off up Anemone Hill. It is famous for the fields of colorful anemone in the spring and is fairly steep, gaining about 1,100 feet in 1.2 miles. The views of Boulder from the highest point, marked by fascinating massive quartz blocks, are beautiful. The trail is not very popular, so it is not crowded most of the time, offering hikers a good chance to spot some of the local wildlife, such as coyote, mountain lion, black bear, elk, and fox. 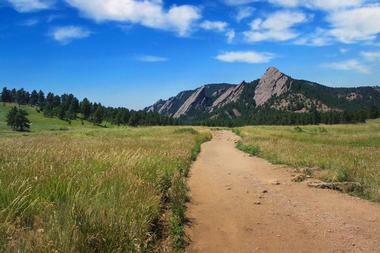 The Bear Peak Trail is a fairly strenuous 7.7-mile loop trail near Boulder that does not get much traffic. The trail starts pleasantly through meadows filled with flowers and continues uphill through pine forests and then to large rocky boulders, which make the hike technical at that point. 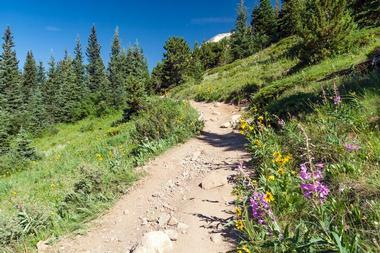 The trail is rated as difficult as the elevation gain is 3,018 feet. Dogs are allowed on a leash. The views from the peak are spectacular. The Bobolink Trail is a nice, easy, and mostly paved 3-mile trail with not too much traffic located very close to Boulder. 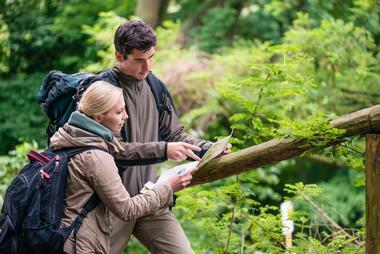 Not for those who want to push their adrenaline, this trail is very pleasant for nature lovers. It passes along a brook and is near a lake, so there are many birds in the surrounding bushes and trees. Dogs are allowed. 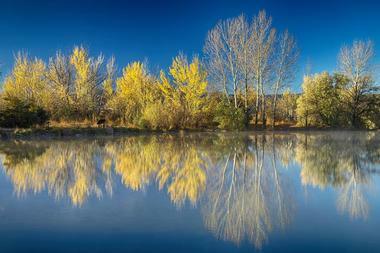 The Coot Lake Trail is an easy 1.3-mile flat loop trail around Coot Lake near Longmont, Colorado. A part of the wide, smooth path is shared with the Boulder Reservoir Trail, which you can take if you want to extend your hike to 7.6 miles. Both trails are surrounded by prairie grasses and wet meadows, and are full of birds and wildlife. Dogs are allowed and do not have to be leashed. Both trails are very popular and can get crowded on weekends. The Davidson Mesa Loop Trail is a 3.3-mile trail near Boulder's Louisville neighborhood, flat and easy and surrounded by rustling tall prairie grasses in the Colorado Rockies foothills. It is long enough to offer a good workout, but easy for all skill levels. There are benches along the trail to take a break and enjoy the magnificent view of the mountains. This is a year-round trail and is also open to mountain bikes. There is a narrow dirt trail you can take on the way back for a bit of change. Dogs are allowed as long as they are on a leash. The Doudy Draw Trail is a 5.1-mile loop trail located near Boulder, Colorado, that passes along a creek and is fairly flat and smooth, with only a few rocky patches. It is good for all fitness levels. The trail is also a bike trail and gets very crowded at times. 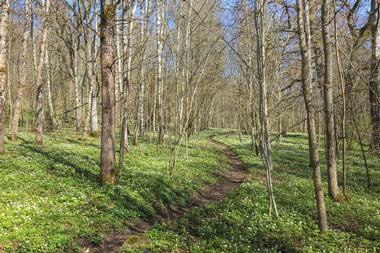 A number of other trails loop from the Doudy Draw. As it meanders south, the trail meets Spring Brook Loop Trail, which runs toward the Eldorado Mountain Habitat Conservation Area. From the junction with the Spring Brook Loop Trail, on its way east, the Doudy Draw Trail crosses the creek and runs up to the Flatirons Vista Trails, which open to beautiful stands of ponderosa pine. The Dry Creek Trail is a 1.8-mile easy, almost flat dirt trail that runs along Dry Creek through the grassy plains east of Boulder. The west end of the Dry Creek Park is surrounded by majestic 200-year-old cottonwood trees. A big part of the park is fenced and serves as a large, free dog park. The view of the mountains beyond the Baseline Reservoir is magnificent and it is possible to spot eagles or other wildlife on a quiet day. 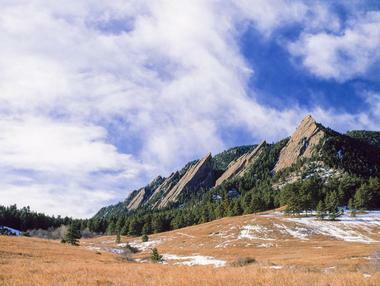 Flagstaff Mountain looms over the city of Boulder and is the city's most popular hiking and mountain biking destination. 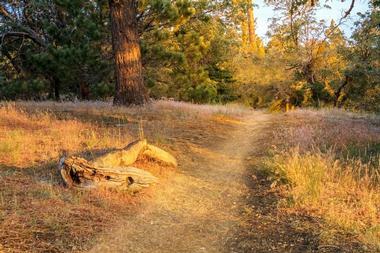 The Flagstaff Trail starts climbing as soon as you leave the Gregory Canyon trailhead. It is a steady, gentle incline and there are only few difficult spots and technical obstacles. The trail meanders through dense, old pine forest, with views of the Chautauqua area and Boulder appearing through the trees at times. After about 2.5 miles, you will reach the Flagstaff Mountain summit area at an elevation of 1,300 feet. Located just a few miles from the town of Eldora, the Fourth of July Trail is a starting point to a range of amazing destinations, taking you to various mountain peaks, lakes, waterfalls, rivers, and spectacular mountain scenery. The trail got its name for the old Fourth of July mine – you will pass by its ruins along the way. This nice trail is very popular for day hikes, mountain climbing, and wilderness camping and is a gateway to the Indian Peaks Wilderness. The trail runs parallel to the fast, cool waters of the Middle Boulder Creek, with scenic waterfalls and some easy creek crossings. You will reach Indian Peaks after about 2 miles, but many other branching trails can take you to more adrenaline-filled adventures. 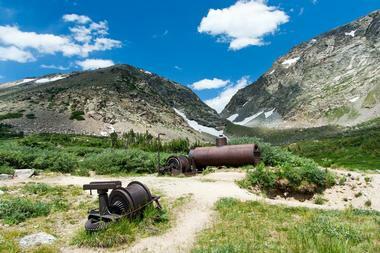 Green Mountain Loop is a 6-mile challenging loop hiking trail near Boulder, best used from March until November. 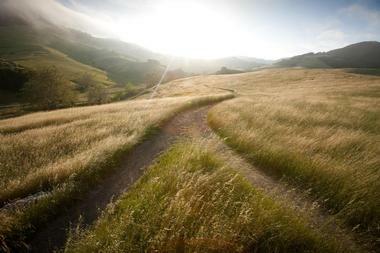 Starting from the Bluebell Trail, where it is surrounded by wildflowers, it heads towards Gregory Canyon. After that the hike gets more difficult, with many high steps and rocky areas. From the trailhead, you will gain 2,867 feet in elevation, so be prepared for a lot of breaks. The views from the Green Mountain peak of the Indian Peaks and Boulder Head are spectacular. 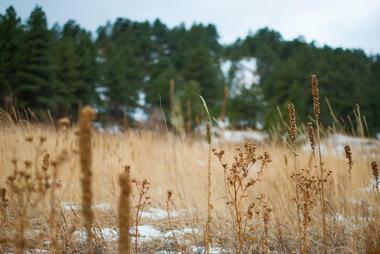 Located at the base of the Flatirons, Mallory Cave is a well-known home to a population of Townsend's big eared bats. 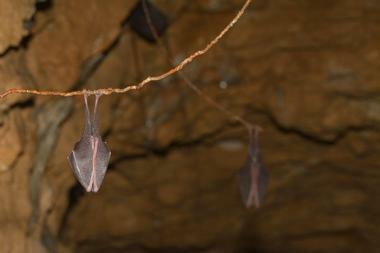 The cave is closed with an iron gate to protect the bats, but it is still worth a trip. 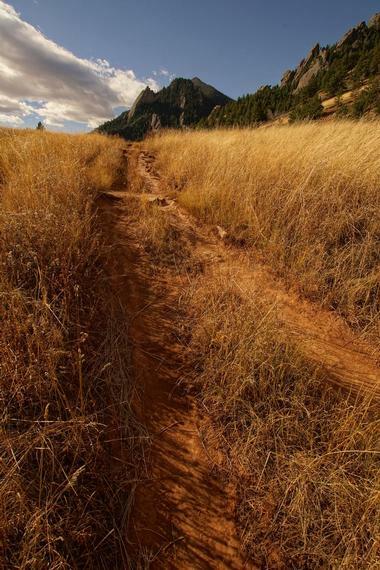 The best way to access Mallory Cave is from the National Center for Atmospheric Research (NCAR) building, or you can join the Mesa Trail from Chautauqua Park. It is only a 2.8-mile loop from the NCAR, but you will have to work for it – you will gain 940 feet of elevation. You will hike through majestic fragrant pine forests and ancient geological formations and once on top, the view will take your breath away. Marshall Mesa Loop Trail is a roughly 3-mile busy and popular loop trail located near the town of Marshall. It is easy and mostly flat, with a few short slopes. It is used by hikers and mountain bikers and gets busy at times. The trail is surrounded by beautiful grassy fields filled with wildflowers in the spring and summer and the views are spectacular all around. Once you get to the top of the mesa, you will be able to see all the way to Longs Peak and Denver. The whole hike takes less than an hour, but you can extend it by linking to other trails such as the Vista, Springbrook, Doudy Draw, and South Mesa trails. 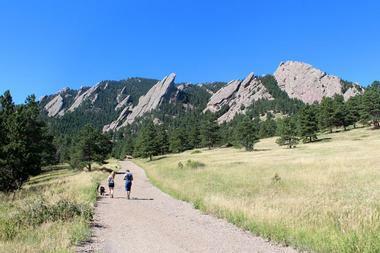 Mount Sanitas is a 6,843-foot mountain located less than a mile from downtown Boulder. The Mount Sanitas Trail is only 3.1 miles both ways, but it will make you work; it is all the way up, gaining 1,343 feet of elevation if you start at the Mapleton trailhead. It is often used by runners who can make it a short 1-hour workout, although there is no need to go fast, the views all around are so beautiful it is worth taking it slowly. To the north you can see the towering Longs Peak and to the south, on a clear day, you can even see Pikes Peak in Colorado Springs. 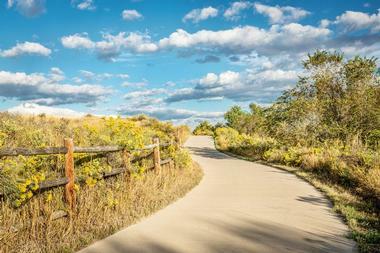 The Olde Stage Open Space is one of Boulder's often overlooked yet very pleasant trails. The trail starts at the parking lot where Left Hand Canyon and Olde Stage Road meet. This 2.2-mile quiet and often deserted trail will take you into Buckingham Park “valley,” where you will stroll among the sea of wildflowers and lush grasses. Only one short incline brings you to the fairly high cliffs of Left Hand Canyon, where the views will take your breath away and you even might spot soaring bald eagles. Shadow Canyon Ridge trail is a 6-mile fairly difficult and complex trail, mostly because it gains 1,120 feet in elevation but also because it changes from gravel pathways to single track, rocky narrow goat track to wide fire road, and then back to single track and gravel pathway. The trail passes through lovely valley pasture full of wildflower, fragrant pine forest, challenging rocky foothills, and dense vegetation, constantly offering magnificent mountain vistas. The trail starts at the Doudy Draw trailhead at the South Mesa parking area. Shadow Canyon Trail starts at the South Mesa trailhead, not far from Eldorado Springs. Stay on the Mesa Trail for a few miles until the sign points to the left towards Shadow Canyon. This steep canyon is full of huge boulders and lot of lush foliage and ferns. From the canyon, the trail is steep but well maintained. On top of the canyon is the saddle between South Boulder Peak and Bear Peak and it is possible to explore both during the same hike. Close to the top, you have to scramble over some large boulders, but the views of the Indian Peaks and the city of Boulder are worth it. 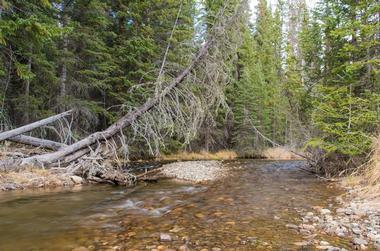 This pleasant 4-mile hike is easy and quiet, across open fields and under the big sky. 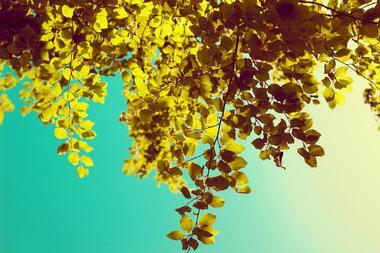 There is no shade, so it is more pleasant during the cooler months. It starts at the small trailhead off Highway 93, about half a mile from the Eldorado Springs gas station. Go south until you meet the Mesa Trail. You can also take the Big Bluestem Trail going west on the narrow dirt path through a gate that will eventually take you to the Mesa Trail. Wonderland Lake Park is a spacious North Boulder neighborhood park next to the lake with open spaces, kids' playgrounds, and water access. The Wonderland Lake Loop Trail goes around the lake for about a mile and half, offering families and kids a nice bit of exercise while watching birds and plants along the trail. From Poplar Street, you can access the dam and try your hand at catching some fish. The Foothills Trail goes north from the lake for about 1.2 miles from Lee Hill Road and later joins the Old Kiln Trail and the Four Mile Creek trailhead, should you want to extend the hike.